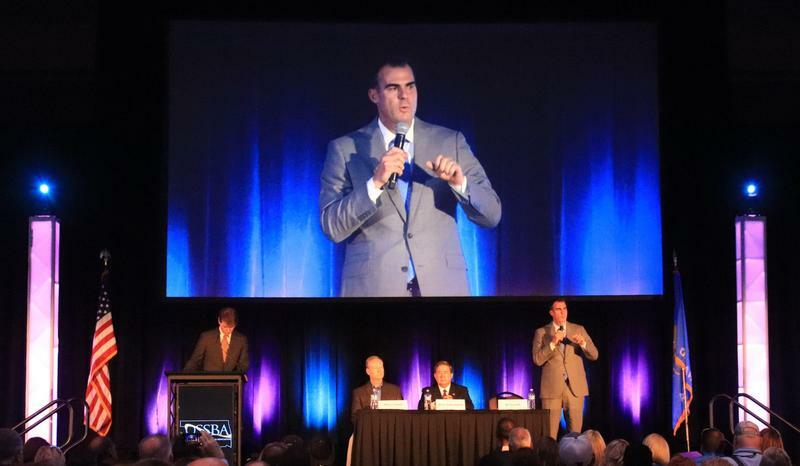 Republican gubernatorial candidate Kevin Stitt promotes his plan for education at the Oklahoma State School Boards Conference in Oklahoma City. Alberto Morejon is one of them. 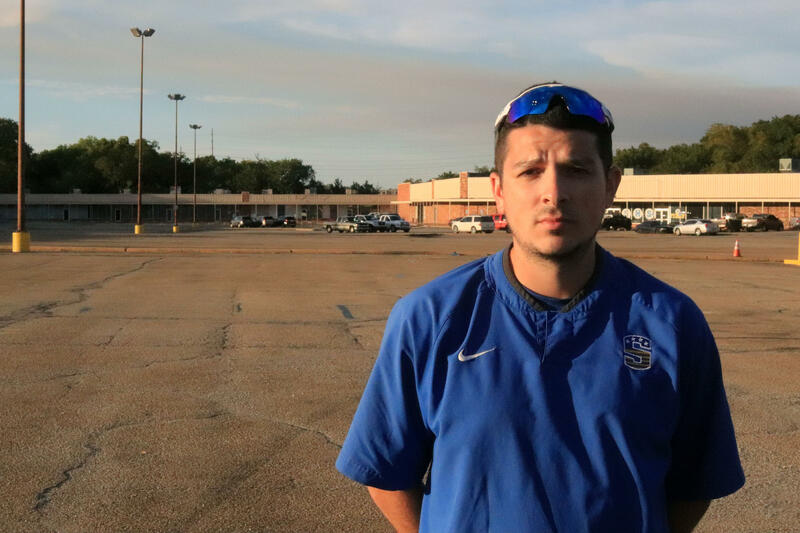 Morejon is an 8th-grade teacher at Stillwater Public Schools largely credited with organizing the teacher walkout in April. He now runs a Facebook page with nearly 80,000 followers, many of them Oklahoma educators. “The No. 1 action they can take in this next session is finding ways to give us back the hundreds and hundreds and hundreds of millions of dollars they took away over the past 10 to 15 years,” he said. Morejon said Oklahoma teachers are tired of lip-service from politicians they feel have failed to keep promises to increase funding. Throughout the 2018 election cycle, educators have sent strong signals they’re ready for change: Teachers are running for office, and a coalition of educators have worked to vote out 12 incumbents. But one rising political outsider who opposes a key issue among many teachers is having trouble getting their support. Oklahoma’s two leading gubernatorial candidates, Republican Kevin Stitt and Democrat Drew Edmondson, have both pledged to increase funding for schools. But Morejon said many educators aren’t clear how Stitt will deliver on that promise. Alberto Morejon is an 8th-grade teacher in Stillwater Public Schools. Stitt, a self-styled political outsider who owns a mortgage company, supported the teacher pay raise lawmakers approved in the 2018 legislative session, but said he would not have signed the $450 million tax package lawmakers passed to fund those raises. “That to me just shows he has no idea of the situation that we’re in,” Morejon said. Over the past decade, Oklahoma schools have experienced some of the deepest funding cuts in the nation, and teachers saw the tax package as the only practical fix. Educators continued to fight for even more tax increases and school funding during the nine-day teacher walkout but were ultimately unsuccessful. Stitt said he wants to increase teacher pay further and is campaigning with a plan that gives new teachers a $5,000 signing bonus starting next year. But the Tulsa Republican is adamant such new education costs could be funded without a tax increase. Lawmakers will have more revenue to appropriate to state agencies in 2019 than they did last year, and Stitt proposes using some of that money to fund another teacher pay raise. “I don’t even know why we would be talking about new taxes when we’ve got a billion dollars more in revenue,” he said in an interview with StateImpact. Stitt said he’ll find additional money for education by consolidating state agencies and eliminating government waste. He also wants to change the way schools are funded. Stitt said public school officials are too restricted in how they can spend property taxes and wants to give them more flexibility with those dollars. He also thinks local leaders should be allowed to increase funding for teacher pay and other local district operations by voting to raise their property taxes — something they can’t currently do. Rob Reck, a retired music teacher of more than 30 years, is among the educators with doubts about the Republican candidate’s plan for funding schools. “When I see our failures over the past 10 years in state government, that is pretty much what I hear from Kevin Stitt,” he said. Reck, a conservative who’s only voted for a Democratic governor once before, plans to vote for Drew Edmondson in November. Reck thinks the Muskogee Democrat has a more clear-cut plan for how the state should increase revenue and send more money to schools. Edmondson’s plan satisfies many demands laid out by educators after the walkout. He promotes raising taxes on oil and gas production, cigarettes and eliminating the capital gains tax deduction. Reck compares Stitt’s education plan to the running gag in the “Peanuts” animated television series where Lucy repeatedly entices Charlie Brown to kick a football, but then pulls it away at the last moment, causing Charlie to fall. Reck says Lucy holding the football represents politicians’ promises to increase school funding by auditing state agencies and finding waste in government, and Charlie is a stand-in for teachers who have believed for years that this method will turn up more funding. Reck says he trusts Edmondson’s plan to increase school funding because it mirrors the only thing that has led to additional school funding in recent years: tax increases. While school funding is a top concern on many Oklahomans’ minds this election season, it isn’t the only issue worrying the public — and Stitt’s message is resonating with many voters. Justin Wood, a mediator from Wellston and a Democrat, plans to vote for Stitt on Nov. 6. “I believe Stitt is the better choice for Oklahoma,” he said. Wood sees corruption as the biggest problem plaguing Oklahoma government, and he says establishment politicians like Edmonson — a former district attorney and state attorney general — haven’t done enough to stop misuse of public funds and root out waste and fraud. Wood likes Stitt’s proposal that would require lawmakers to publish a line-item budget, which he thinks could reduce corruption and turn up more cash for state agencies. “All the public entities that are using public funds, he wants to put them online for the people to see. And he wants it detailed. If you spent $50 million, what did you spend it on?” Wood said. Wood also likes Stitt’s proposals to help schools incorporate more technology into their classrooms, such as video conferencing to give students in rural districts access to advanced classes — an idea he said is innovative and efficient with public tax dollars. Recent polls show Stitt with a small lead over Edmondson, and Libertarian candidate Chris Powell trailing a distant third. Alberto Morejon, the teacher from Stillwater Public Schools, is encouraging the people that follow his Facebook page to do their research and avoid voting based on party alone.